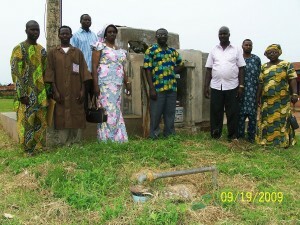 The Baptist Medical Centre in Saki had an excellent water well but no piping distribution system. For many years the water had to be carried once a day by an aging tanker truck to small tanks adjacent to each of the many buildings on campus. When NFW Council member Gita Larson visited her old home town in 2005, she was approached by the hospital’s director Dr. Segun Ojebode about the need for a greatly improved supply system. The hospital has served the people of the Saki area since 1952. Gita Larson’s mother Margaret Richardson was the first doctor on staff there. The compound is the site of not only the hospital but also staff housing and a large school. About a thousand people are on the grounds every day as patients, staff, residents, or students, and they all need water. NFW volunteer engineer Chris Strock drew up plans for a large overhead tank at the highest point on the property and a gravity-fed piping system to supply all the hospital buildings, staff residences and the school. Dr. Ojebode directed the work with guidance from Rev. 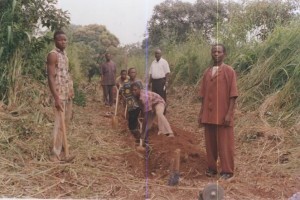 Taiwo Wojuola, a skilled plumber who had been involved in previous NFW water projects. 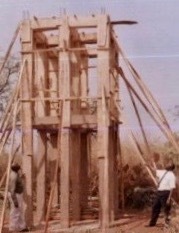 The Medical Centre staff dug underground trenches, laid and connected all the pipes, built the overhead tank tower, and installed all equipment including pumps and valves. Now the Medical Centre has clean water at all campus buildings all the time.